In armed conflict, should human rights groups prioritize accountability or peace? How should the rights movement address critical internal challenges, such as the different positions taken on Syria’s humanitarian crisis? What should the role of political Islam be in rights movements? What strategies should the human rights movement adopt amidst sharp polarization of the authorities, political elites, and rights defenders? What limitations do various contexts put on the human rights movement? 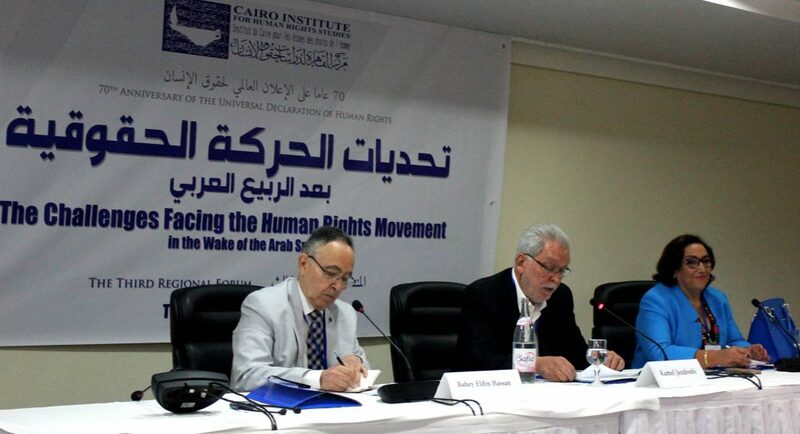 Is there a future for the human rights movement in the region, and if so, what will that future look like? 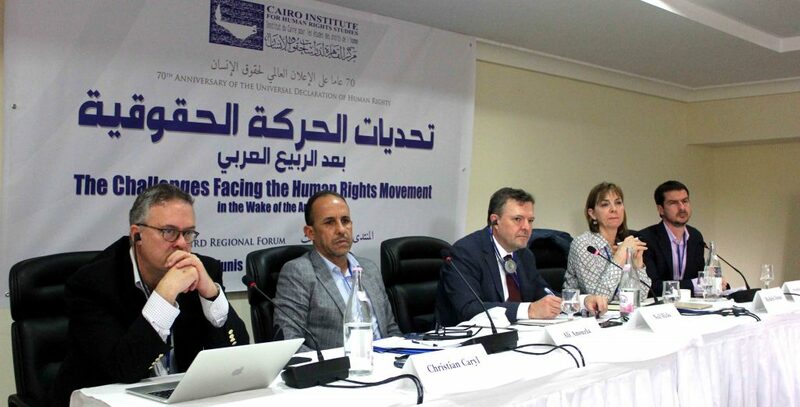 These were just a few of the pressing issues debated at the Third Regional Forum of the Human Rights Movement in the Arab World, organized by the Cairo Institute for Human Rights Studies (CIHRS) and held in Tunis on November 3 and 4th. With the Arab region awash in violent conflicts and deepening authoritarianism, the forum offered a rare opportunity for rights defenders, academics, and media figures to discuss these challenges and potential remedies or strategies to address them. In his taped address inaugurating the forum, Andrew Gilmour, the UN Assistant Secretary-General for Human Rights in New York, applauded the “special kind of courage” required to defend human rights in the Arab region. Many individuals possessing that exceptional courage participated in the forum, including rights defenders, academics, and media figures; a total of 50 from ten countries around the region (Egypt, Tunisia, Syria, Lebanon, Palestine, Yemen, Libya, Algeria, Morocco, and Iraq) as well as from Germany, Iran, and the United States. Organized around the theme “Issues for the human rights movement in volatile political and social contexts,” the forum addressed challenges facing human rights activists in the region since the Arab Spring and the impact of these challenges on their priorities and operating methods. Qualitatively new risks have emerged, up to and including assassination, as tragically illustrated by the murder of journalist and democracy advocate Jamal Khashoggi inside the Saudi consulate. Human rights defenders are also at severe risk for politically motivated prosecution, as well as death threats and incitement, such as that faced by CIHRS director Bahey eldin Hassan. With the opening session moderated by Kamel Jendoubi, the head of the United Nations’ Group of Eminent Experts (GEE) on Yemen and CIHRS’ chairman of the board, the forum was comprised of eight panel discussions and the presentation of participants’ papers and research. Participants included Bushra Belhaj, the president of the Committee for Individual Freedoms and Equality in Tunisia and a parliamentarian, who spoke of the importance of working on issues of equality and personal rights, given the erosion of these rights in most countries in the region. Bahey eldin Hassan, the director of the CIHRS, also participated, highlighting the objectives of the forum and its importance at the present moment. In the closing session, five experts presented a set of recommendations and conclusions based on the two-day dialogue. Launched in 2014, the regional forum is an initiative of CIHRS, with the goal of creating a framework to discuss pressing issues relevant to democratization and respect for human rights in the Arab region. In the wake of the Arab Spring, the forum addresses pivotal questions and issues about the prospects for defending human rights in the region, with an emphasis on how to best support the rights movement amidst a backdrop of retrenching authoritarianism and escalating violence and terrorism. This year’s forum focused on the rights movement’s future in Egypt, Syria, Yemen, and Libya; as well as in Tunisia, Morocco, and Algeria. In his final speech, Bahey emphasized that he considered the forum to be a significant contribution from the HR movement in the region. The forum focused on the future role of the human rights movement and it addressed an essential question dominating academic, cultural, and political circles: Is there any future for the defense of human rights – not only in the Arab region but throughout the world? This important discussion will be continued soon at future forums.